‘Tis the season for smartphone launches! Samsung just announced a brand new mid-range smartphone, the Samsung Galaxy A9, to add to their already stellar lineup and, in an effort to avoid burying the lead, it has four rear-facing cameras. With the Samsung Galaxy S9 considered one of the best smartphones on the market and a history of quality devices, the Samsung Galaxy A9 has all the potential it needs to be a great phone. The South Korean based conglomerate is planning to use the Galaxy A9, and it’s other mid-range devices, to test out features before launching them on high-tier smartphones. And one of those features is, apparently, four rear-facing cameras. Before delving into the madness of four rear-facing cameras on a smartphone, let’s go over some of the basics of the Samsung Galaxy A9 before our preconceived notions get the better of us. As far as the specs are concerned, the Galaxy A9 is exactly what you’d expect from a mid-range smartphone. The screen is comparably to the iPhone XS Max and the Pixel 3 XL. It’s running a barely outdated Android software, with a similarly “new but not brand new” processor. As with most Samsung devices, the storage potential is high, as is the RAM. While most of these specs are in line with industry standards, that camera spec is no typo. In addition to the highest number of rear-facing cameras on a smartphone, the Samsung Galaxy A9 boasts one of the best cameras on a device like this. And if you think that’s the only amazing camera feature they threw into this phone, you couldn’t be more wrong. 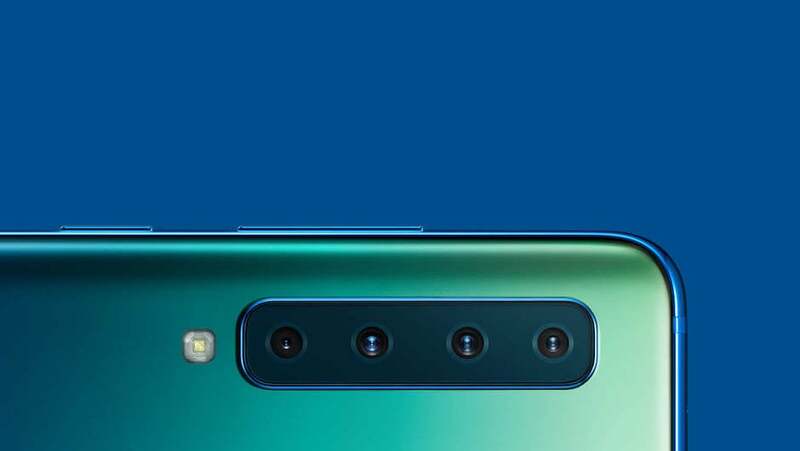 Just to reiterate, the Samsung Galaxy A9 has four rear-facing cameras. Four! The first camera is the 24 megapixel standard camera, which alone would’ve put this phone on the radar of any respectable Instagram photographer. The second is 8-megapixel wide angle camera with a 120-degrees lens, perfect for those larger group shots. The third camera comes with a telephoto lens, which provides 2x zoom without losing resolution. And the fourth and final camera is a 5-megapixel beauty that enables the depth-of-field effects found in so many portrait mode pictures on social media. Those four cameras, combined with the single front-facing camera, put the Galaxy A9 firmly in the fight for most cameras on a phone ever with the LG V40 ThinQ. As for what they look like, well, we’ve seen more aesthetically appealing smartphones at Toys ‘R Us. At least, we used to. When you look at what these cameras do, having four of them hardly sounds ridiculous. After all, when you don’t have Google or Apple’s software capabilities, you have to compete somehow, and four cameras seems like the best way they know how to do so. 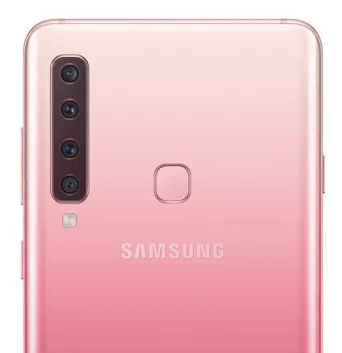 Still, all those cameras make the Galaxy A9 look like a traffic light, which is hardly the aesthetic you’re looking for in a smartphone. As mentioned above, adding four rear-facing cameras to a mid-range phone rather than one of their high-tier models is a new strategy at Samsung designed to test out new features before they hit the more hot ticket items. “In the past, I brought the new technology and differentiation to the flagship model and then moved to the mid-end. But I have changed my strategy this year to bring technology and differentiation points starting from the mid-end,” said DJ Koh, Samsung’s Mobile CEO to CNBC. Samsung is the king of the smartphone world right now, so this move could be as well-researched and soundly executed as we’d expect from such a success company. It does mean, however, that we’re going to have to wait and see if four rear-facing cameras makes it past this first test. The Samsung Galaxy A9 has a 6.3-inch display. For nostalgia sake, the Samsung Galaxy A9 does have a headphone jack. How much does the Samsung Galaxy A9 cost? While prices haven’t been announced in the US, international customers can expect to pay €599 in Europe and £549 in the UK (approximately $724). When is the Samsung Galaxy A9 available? The Samsung Galaxy A9 doesn’t have a firm release date yet, but is poised to hit shelves sometime in November. Should You Buy the Samsung Galaxy A9? Unless you’re a fervent early-adopter of unique-looking devices or a photography buff that can’t afford the Pixel 3 or the iPhone XS, the Samsung Galaxy A9 is probably not worth taking the risk. As mid-range phones go, it’s still pretty expensive, and a smartphone running outdated software on an outdated processor is only going to age that much faster in your pocket. As for the cameras, adding additional lenses to smartphones has become the flavor of the season, but it won’t last for long. Consumers are quickly reaching their improvement limit for cameras, and four of them isn’t going to make that much of an impact on an incredibly competitive smartphone market. Similar to the problem facing the television industry, there’s only so much resolution you can add before the human eye can’t tell the difference anymore. Admittedly, Samsung did a great job of drumming up media attention on a mid-range phone, something that rarely happens, if ever. Unfortunately, media attention doesn’t turn into purchases, particularly on a phone with not much to write home about other than its record-breaking number of rear-facing cameras. Just remember: Sometimes, less is more, even when it comes to cameras on smartphones.